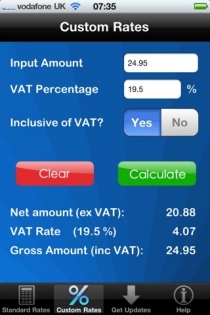 Calc VAT is an easy to use VAT Calculator, designed to make calculations faster for you! Worried about VAT Fraud no problem Calc VAT can also validate VAT Numbers for you to make sure invoices you pay are correct. 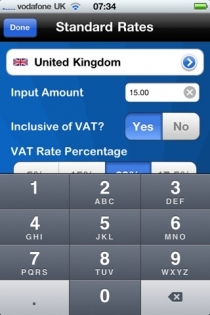 With this application you can even select VAT Rates from any country in Europe and also set custom VAT Rates. - Reviewed in the iPhone App Directory Magazine. - BBC4 Money Box as the app for helping you, combat VAT Fraud. Simply enter the amount you wish to calculate and select f you want to find out the inclusive VAT or add VAT to the original amount. Calc VAT will show you the breakdown of the amount and at any time you can change the rates or inclusive VAT settings, and the breakdown will automatically update for you. 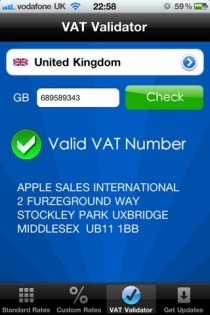 This application fully supports the UK standard VAT Rate 20%, along with the old rates 17.5%, 15% and 5%. 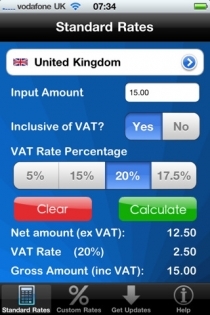 With Calc VAT you can even select different countries and calculate VAT for any country in Europe! Calc VAT helps combat VAT Fraud as mentioned on BBC4 Money Box, simply enter a VAT number you would like to check and Calc VAT will confirm if the VAT Number is valid, along with showing you the registered company name and address. You can now calculate VAT or percentages using our brand new custom rates screen. We have also included a Get Updates screen in the application; here you can check for new VAT Rates at a click of a button. We are very keen to make Calc VAT just right for you, please let us know in your reviews what new features you would like us to add to this application.